That is not our Moon. It’s Dione, and it’s a moon of Saturn. The robotic Cassini spacecraft took the featured image during a flyby of Saturn’s cratered Moon last month. Perhaps what makes this image so interesting, though, is the background. 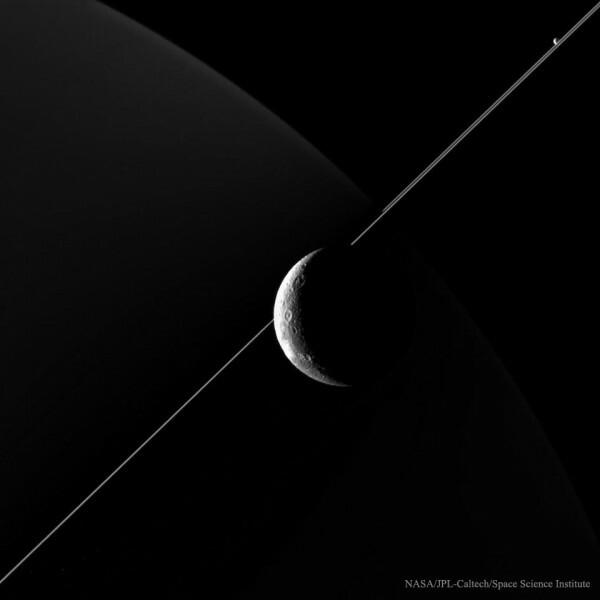 First, the large orb looming behind Dione is Saturn itself, faintly lit by sunlight first reflected from the rings. Next, the thin lines running diagonally across the image are the rings of Saturn themselves. The millions of icy rocks that compose Saturn’s spectacular rings all orbit Saturn in the same plane, and so appear surprisingly thin when seen nearly edge-on. Front and center, Dione appears in crescent phase, partially lit by the Sun that is off to the lower left. A careful inspection of the ring plane should also locate the moon Enceladus on the upper right.